Need to brush up on the difference between a natural & washed process coffee? Read our blog post on coffee processing methods. Finca San Jose de las Nubes is located in the cloudy highlands near Matagalpa, Nicaragua. Its owner, Bayardo Reyes, grew up on his family’s coffee farm in the same area. After being forced to flee the country during the Nicaragua Revolution, Bayardo returned to the area in the 1990s and purchased what is now Finca San Jose De Las Nubes. His brother, Alvaro, runs the coffee program on the farm, and together with their employees, they work hard to produce coffee that has improved year after year. The main goal on the farm has always been to improve the lives of the people working and living there. Typically processing their coffee with the washed method, this year was the first time the brothers produced a natural process coffee. >> Read more on Finca San Jose on our farm feature page. We first met Bayardo and his wife at SCAA in Portland April of 2012. Augusto (Nossa Familia's founder & owner) had gone to school with Bayardo's wife during college, and now they had more of a reason to talk than to just catch up. Bayardo had been running a farm in memory of his grandfather who used to farm coffee before the revolution. We were some of the first to get our hands on Bayardo's coffee, and provide him and his team with our cupping scores, and notes from green grading. We were quite excited because, from the very beginning, the coffee was scoring above an 80 (in other words it was specialty). From there, Bayardo and his team have worked hard to improve the quality of the coffee, as well as use the coffee to improve the lives of those who live and work on the farm and surrounding villages. 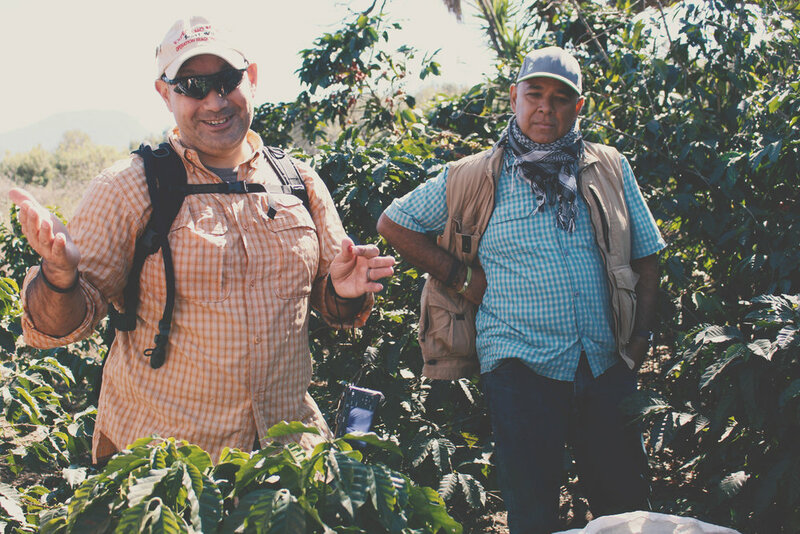 More than just a quality fit, Bayardo and his family represented an ideological fit for us in that they see coffee as a way to improve people's lives around the world. We have been proud to partner with Finca San Jose de los Nubes and Bayardo for the last 4 years, and cannot wait to see where this relationship goes in the future. The washed coffee is one of the best coffees they've had for their main harvest yet. It's bright, clean, sweet, floral, and absolutely delicious. Their natural which they introduced this year is insane. It is every bit as clean as a washed, with that amazing fruit-centric character people love from naturals. Frankly, it is one of the best naturals I've had in a very long time. 1. What do you want people to know about your coffee? I think that the most important message about our coffee is that we continue to improve on the current coffee and we strive to perfect our natural process. This direct reflection of the team that works in the farm. When you provide a stable job and a respectable working environment, the results are seen in the enthusiasm and hard work the team puts when gathering to provide the best coffee they can. The workers of Finca San Jose put their hearts and souls into producing top quality coffee and helping the community. The reward is when the final products are sampled by the buyer, and the “I just had top quality coffee” face emerges after their done with the cup. It’s an incredible feeling of accomplishment because you know that in one sip you helped represent the heart and soul of an entire community of hard working people. 2. Why did you decide to do a natural process coffee? The idea to do natural process coffee came from both of us. We asked ourselves “How would the coffee’s flavor be if we dried natural process?” And that’s where we got the idea to get started. It took about two years for us to feel comfortable with the process and have our direct trade partner taste the coffee. We had a steep learning curve, as the natural process is not commonly used in Nicaragua. We didn’t have much guidance, but we took the challenge head on. 3. How did you learn to do the natural process? We learned the natural process by asking and visiting other farms in Guatemala and Colombia. Believe it or not, Google was also our friend. We googled techniques, then tested and validated them on the farm through experimentations. We also applied the ideas collected during these visits to our process, starting with small lots and diverse drying techniques, playing with the temperature, the wind, and of course, the sun. This is not a process many other coffee farms follow, and the few that do don’t like to share their secrets. So, we gathered some ideas and created our very own version of it to produce perfect coffee, free of defects. 3. What were the biggest challenges in the process? Anything that surprised you? There are many challenges in this process, as all steps are important and cannot be overlooked. It is essential to have our people properly trained in the selection and collection of coffee cherries. To start, the dark read cherries are handpicked, and those that don’t pass our high standards are filtered out. Then the impurities are washed out. Followed, they are packed and sent to the dry mill, which is located 40 km away, through treacherous unpaved roads. We have a time limit of two hours to get it to the dry mill. After that, the coffee can become fermented in the bags and the quality will start to decrease. Once the hand selected cherries arrive, specialized personnel awaiting the shipment start the distribution and then the drying process begins. This process takes approximately 23 days of constantly monitoring the humidity and color of the cherry. Those in charge of this process have to keep it in constant movement, about 6 or 7 times more than the typically (fully washed) coffee. What was surprising for us, as it was the first time we did it, was that after so much effort and sacrifice from the working team at Finca San Jose, the final results yielded two completely different coffee profiles. Which one is a favorite can be answered once both coffees have been tested, side by side. 5. Anything else exciting or interesting happening on the farm now that you want to share with folks? We firmly believe that coffee is a tool to make people life's better. With the help of our roaster partners, we continue to improve the lives of the community. One of those exciting projects is bringing electrical power to the community. Thanks to their hard work at the farm and fixing the dirt road, the government has decided to introduce electricity to the area. This is great news. We are also excited about the school and the kitchen project, both possible in great part thanks to the wonderful relations we have built with our direct trade partners. In addition, we purchased a projector and laptops for the school, so we can start introducing technology to assist teachers in educating the community. We will continue to work hard to make things better for the community and the partnerships that have formed thanks to likeminded people who come together to make the world a better place through a wonderful channel such as coffee. I look forward to the next harvest. How did you brew the coffee? What ratio/parameters did you use? What flavor notes would you use to describe it? Did anything surprise you about the coffee? How would you rate the coffee?